Sab The Book Eater: 5 Stars for A Mad Wicked Folly by Sharon Biggs Waller + A GIVEAWAY! 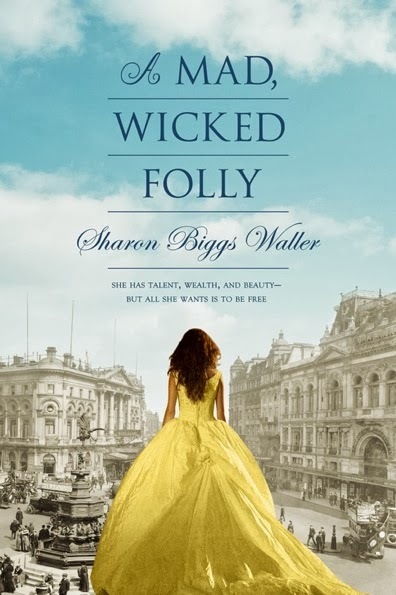 5 Stars for A Mad Wicked Folly by Sharon Biggs Waller + A GIVEAWAY! I LOVE THIS BOOK. This isn't the best way to start a review but I just wanted to get that out quickly because I'm still experiencing a hangover from reading this extremely enjoyable young adult historical fiction from Sharon Biggs Waller. I'm a history junkie but I haven't read as many historical fiction books as I would like lately. I'm glad I had the opportunity to read A Mad, Wicked Folly because it had everything I love about historical fiction. The story is told through Victoria Darling's eyes, a seventeen-year-old in 1909, a year when things started changing for women in London. What I liked most about Folly was how smoothly Vicky's story was incorporated into history. I only know little about that time period (hello, Downton Abbey) but thanks to the interwebs and the author's notes which I enjoyed reading just as much, I got a sense of what really went down during their time. It also helped that the author did a great job at describing everything in vivid detail. I could just imagine the fashion, the events that took place then and the people involved. The suffragettes and their rallies, the upper-class women clinging to tradition, the painful s-bend corsets that reached the thighs (yikes) - it was such a pretty picture and Waller painted it very well. Vicky's transformation wasn't easy and I love that it took a while for her to see the bigger picture. She started out only dreaming about becoming a real artist, the kind that learns techniques in art school and have their work displayed for the public to see. During their time, women didn't enjoy the same freedom and equality we experience today in our society. A woman can get a law degree but won't be allowed to practice. Even displaying their artwork in a gallery alongside men's was frowned upon if not forbidden. So I can just imagine how hard it was to make their dreams come true during their time. But Vicky wasn't one to just quit on her dreams. Her passion to pursue a life in the arts drove her to actively fight for the freedom many women were denied. She started sneaking around at first and doing things for her own dreams. After some time though, she saw that she's part of a bigger fight; hat she has to stand up for women everywhere, even those who were against the suffragettes. She may have relied heavily on her father's wealth and did anything they required of her but that was only because she was after her dreams. But when reality hit her, she fearlessly went against everything that held her back. Vicky realized that she can make a life of her own. I just love how strong of a character she is and that she transformed over time. Whether you're into historical fiction or not, I would most definitely recommend you give A Mad, Wicked Folly a try. The beautiful storytelling, the engaging plot, the vibrant characters, and hey, even the sweet romance between Vicky and the police constable Will - you just can't go wrong with this book. I happened on this book before over at goodreads now i will be sure to have time to read it coz historical romance is my first love and so i am familiar with the period setting and i always do love a strong heroine. I am not a very daring person in general and so outdoor activities are a challenge for me my bff dared me to ride a zipline last year which i did but i was screaming all the way down lol! My latest daring thing.. I think starting a book club with other Dutch book bloggers. I'm not good at socializing with new people, so meeting them the first time was definitely a huge step for me :) I can't wait to read this book. I love the setting and Vicky sounds like an awesome character. I think last week! I started to join the blogging world and I'm happy about it. I can't wait to read this, it seems amazing based on the synopsis. Thanks Sab!